Rush University Medical Center is part of a new clinical trial testing whether an experimental vaccine can help patients’ immune systems stop the spread of glioblastoma — an aggressive form of brain cancer with very few current treatment options. 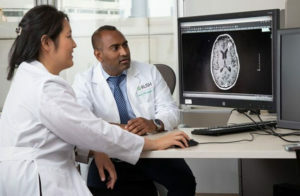 Led by neuro-oncologist Clement Pillainayagam, MD, the phase II clinical trial is testing an investigational vaccine that will be given in conjunction with bevacizumab, an FDA-approved drug that targets the proteins glioblastoma cells need to grow blood vessels. Rush is one of only a few Midwest locations for this international trial, Drug Treatment Study for Recurrent or Progressive Glioblastoma. Glioblastomas are malignant tumors that begin in the glial, or supportive, tissue of the brain and spread rapidly because they are supported by a large network of blood vessels. There is no known cure for glioblastoma tumors, and median survival is just four months without treatment and 15 to 19 months with treatment. In a stark reminder of the need for better treatments, U.S. Sen. John McCain died from glioblastoma on Aug. 25, one of more than 15,000 people in the United States who succumb to brain cancer each year, according to the National Cancer Institute. Current standard treatments typically involve surgery followed by chemotherapy and radiation therapy. Immunotherapies like those being tested in this trial, which engage the body’s immune system to attack tumors, increasingly are becoming part of treatment plans. “Our immune system would typically put a stop to cancer cells growing, but glioblastoma cells suppress this process,” Pillainayagam explains. “Bevacizumab has been shown to help the immune system starve tumors of their blood supply as well as decrease the immunosuppressed state around the tumor. But that just isn’t enough,” he said. Half of the study participants chosen at random will receive bevacizumab, and the other half will be treated with bevacizumab plus the experimental vaccine. The vaccine (DSP-788-201G) is derived from peptides (short chains of amino acids) produced by the WT1gene that is found in many types of cancer cells, including glioblastomas. The vaccine is used by the HLA (human leukocyte antigen) system, cell surface proteins that help regulate the immune system. “While the bevacizumab helps starve the tumor by blocking formation of blood vessels inside it, we hope the vaccine revs up the immune response by helping the body recognize that these cancer cells are a threat,” Pillainayagam said. Though the development in recent years of therapies that help people’s own immune system target cancer cells has meant new options for many types of cancers, very few immunotherapies for cancers in the brain have shown promise. “The brain has different types of immune cells that work in unique combinations. Thus, trying to understand how to unleash our own immune systems is a challenge,” Pillainayagam said. One challenge is actually a barrier: The human body evolved a layer of specialized cells, called the blood-brain barrier, that line the blood vessels in the brain, providing extra security from threats such as viruses and bacteria that circulate in the rest of the bloodstream. That extra layer of protection also prevents many cancer-fighting drugs from working. By some estimates, 98 percent of current FDA-approved drugs do not enter the brain because of the blood-brain barrier. Along with Joo Yeon Nam, MD, Pillainayagam leads Rush’s Section of Neuro-oncology, which works in conjunction with specialists across Rush’s Department of Neurological Sciences to treat patients with primary cancers of the brain and spine. “The brain is sensitive and exquisite real estate. Everything we do and even who we are depends on the brain functioning well, thus even a tiny growth can have an enormous impact,” Pillainayagam says. Nam says that the dual training in oncology and neurology is especially necessary because brain cancers have such deep impact on the quality of life of patients and their families. In addition to causing neurological problems such as weakness, seizures and impaired speech, “brain cancers like glioblastomas affect the part of the body that makes people who they are,” she says. Learn more about the clinical trial here or by calling (312) 942-4500. Patients cannot participate if they have received prior bevacizumab therapy, or have received antineoplastic therapy, including radiation therapy, for first relapse or recurrence.